This derivative map of London was published as frontispice to Volume I of William Maitland's 'History of London'. As stated in the note below the plan, the map was reduced from a large print in the collection of Sir Hans Sloane. This is believed to be the woodcut view attributed to Ralph Agas, and copied for the Society of Antiquaries in 1737. 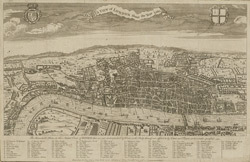 However, some details in the map, such as the delineation of Lambeth Palace, are reminiscent of the so-called 'Copperplate Map': the oldest printed map of the city of which no complete copy has survived , and on which both the Agas view and the Braun & Hogenberg's 1724 map were based.